I studied Human Movement Sciences and Clinical Neuropsychology at the Free University in Amsterdam from 1985 until 1992. After working for 10 years as a neuropsychologist in several psychiatric hospitals I completed my PhD on the influence of endocrine treatments for breast cancer on cognitive functioning at the Netherlands Cancer Institute. In 2011 I was registered as a clinical neuropsychologist. 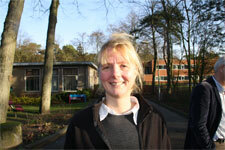 From July 2011 I am working as a clinical neuropsychologist at Altrecht. I combine a position as supervisor for neuropsychological assessments with a position at Altrecht Eating Disorders Rintveld. As a clinical neuropsychologist, I am involved in all research projects at Rintveld in which neuropsychological functioning of eating disorder patients is investigated. Currently, I have anadvisory role in the composition of a neuropsychological testing battery for both clinical as scientific purposes. This offers the opportunity to enhance both the use of neuropsychological assessments in the treatment of eating disorders as the insight in the neuropsychological functioning of eating disorder patients. In addition, I am interested in intellectual functioning of eating disorder patients and associations with eating pathology, comorbidity and treatment outcome.